The philanthropic race to see which school the Iron Bowl rivalry means less to in the grand scheme of things continues this week in Tuscaloosa, where approximately 30 Auburn students and 60 of their crimson counterparts are volunteering with Habitat For Humanity to build a house for an area family that lost their home in April 27th’s devastating tornado outbreak. 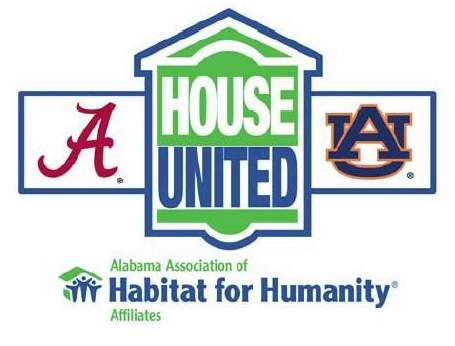 The [House United] project was originally designed for Baldwin County, but that changed after the storms, according to Wahnee Sherman, director of the UA Community Service Center. The new house will have a safe room that was designed with help from a UA engineering professor. The project started Monday and should take four days to complete. We’ll be surprised if some sort of webseries doesn’t develop—this has reality show written all over it; the students aren’t just working together, they’re living together on the University of Alabama campus. Athletes from both schools are supposed lend a hand—and even the mascots. Big Al showed up yesterday. Aubie is scheduled for Friday. No word yet on whether we’ll share our Coke. I think it’s great that people are coming together to help the tornado victims, I really do. But why does it have to be branded with the colleges’ association and this new found love-fest for the opposing school/team. Am I the only one who has grown a little nAUseous with this whole concept?